Yes ’tis I, disguised underneath all the layers of clothing. This bench photo was taken in May 2010 whilst waiting for Old Faithful, America’s most famous geyser, to spring into action. 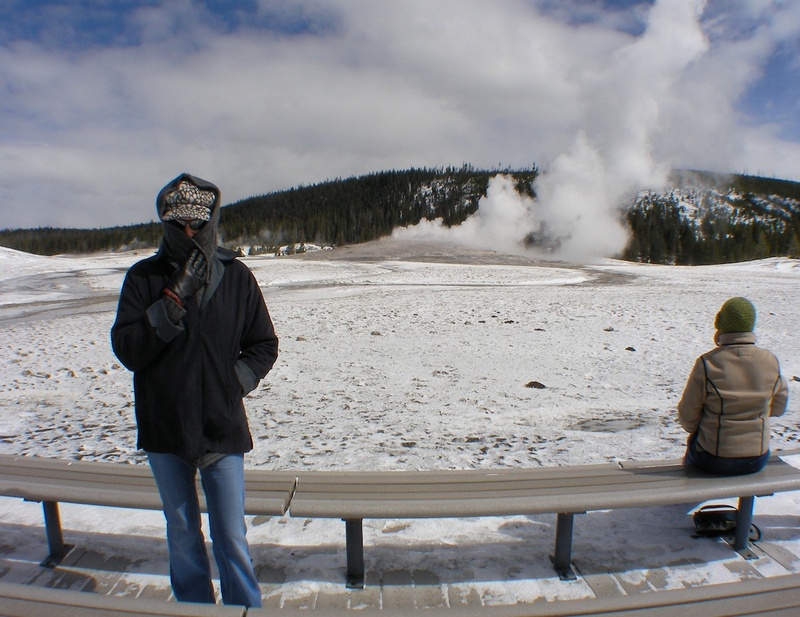 As you can see, Spring hadn’t happened yet in Yellowstone National Park. It was bitterly cold with an icy wind blowing. We were impatiently waiting for the promised spectacular spurt of steam which can shoot from 3,700 to 8,400 US gallons of boiling water into the air. Old Faithful, one of the most predictable geographical features on earth, erupts roughly every 90 minutes, with the jet of steam rising from 106-185 feet, and lasting anything from 1-5 minutes. I was pacing up and down trying to keep warm, but I think the woman on the bench must have been frozen solid. Do you have any photos of benches with someone or something on them, for Jude’s Bench Series #41?